Shared and noted. 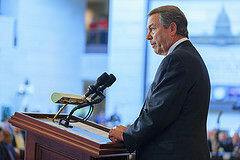 Utterly detest Boehner, but I think we'd be jumping from a griddle into a wildfire! Thanks, O. This would be long overdue! It has finally happened...the GOP are eating their own over which individuals gets the power .... making it difficult for any of them to have the votes,support etc. to make so much as a showing worth mentioning in elections....and for America, that's a very positive step toward restoring our country to our Democracy and Republic for which it stands.